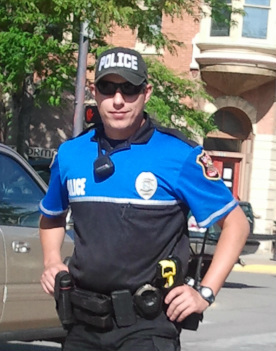 My world was rocked August 2, 2011, when my 27 year old son Nick, was one of three Rapid City Police Officers shot while on a routine public nuisance call. One officer died at the scene, one was shot in the jaw but has recovered and is doing well. My son lived four more days before succumbing to the gunshot wound which struck him one quarter inch from the protection of his bulletproof vest. These were the first officers shot in the line of duty in our city in nearly one hundred years. Both officers were buried August 11, 2011. One in his hometown in Michigan, and my son here, where he was born and raised. My first reaction to this event in relation to my search dogs was that this was an acceptable "out". A graceful way for me to leave my work with Search and Rescue dogs; a very time consuming, expensive, frustrating, emotionally draining endeavor for the most part..... but also, very rewarding when it all comes together. Near midnight, two days after we buried Nick, I received a call from the local SAR group asking for help in locating three children who had run away, lost in the very rugged South Dakota Badlands. Having not slept much for over a week my heart was not in it. It was a gorgeous, warm night with a full moon, surely the kids could wait until morning. Then they mentioned that the kids had emotional issues and were the foster kids of a friend of my husband's. Auri was already in full working mode, she knows when the phone rings in the middle of the night that she is going to work. I awakened my youngest son, (an EMT and my flanker), and we set off on an hour trip to the search area. Upon arrival we were told the kids had already been missing nearly 12 hours and could be miles away. Had that information been known previously, they would have waited until morning to call us out. But we were there now so we set out, adding a sheriff's deputy as an additional flanker. Auri started strong on a trail that descended into the bottoms of the desolate landscape of the Badlands. But once there, between the arid conditions, the lack of vegetation, and a favorable light wind, she abandoned trailing for more efficient air scenting. We crossed the rugged terrain for more than two hours before she made the first indication that she had worked her way into strong scent, a nose to the wind followed by a burst of energy, moving with determination. Fifty yards into the indication I called one of the girl's names and thought I heard something, another call and I definitely heard something. In a matter of seconds we were at the first child. This was the child for which we had the scent article and Auri was not about to leave her after making the find. With Auri watered, rested and finally willing to leave the girl, we set out again, searching for the other children while my son stayed with the found girl. Within a few hundred yards we had located the second girl, quiet and hiding, but relieved to be found. The deputy took the second girl back to the location of the first, and Auri and I continued to search for the boy. The boy was tougher as we knew it was his idea to run away in the first place. Auri pinpointed an area he was likely in, but because of the ruggedness of the terrain, a dog and handler were unable to navigate it in the dark. With both of my flankers occupied elsewhere and with no viable form of communication with me, it was pointless to continue on. After getting the girls back to the staging site, we had one more area to check before we were cleared to leave the search. The area on top of the steep fingers of the Badlands levels out into the Buffalo Gap National Grassland of South Dakota. Auri, my son and I walked this top plateau to make sure the boy had not reached the top and left the area. Nothing. Auri wanted only to go back into the steep crevices of the area she had tried to get into from below, but which were just as, if not more treacherous from above. We left the search just before dawn, confident the boy was in the area of Auri's indication and that he would be found in the daylight, which he was, hiding and watching the searchers. It was a nice find, a really nice find. But the truth was, the kids would have been fine until daylight. That is what I thought as we left the scene. After retelling the story of the search to a friend in law enforcement, we agreed you still need those finds to keep you going. That friend called the following day to say that the hiding boy had been admitted to a mental health facility after making some statements about running away. He had heard voices in his head, telling him to take his sisters into the Badlands and kill them, stabbing them each a specific number of times. He was found with a knife on him. Suddenly that "could have waited for morning" search took on a whole new significance, it became a very good find.